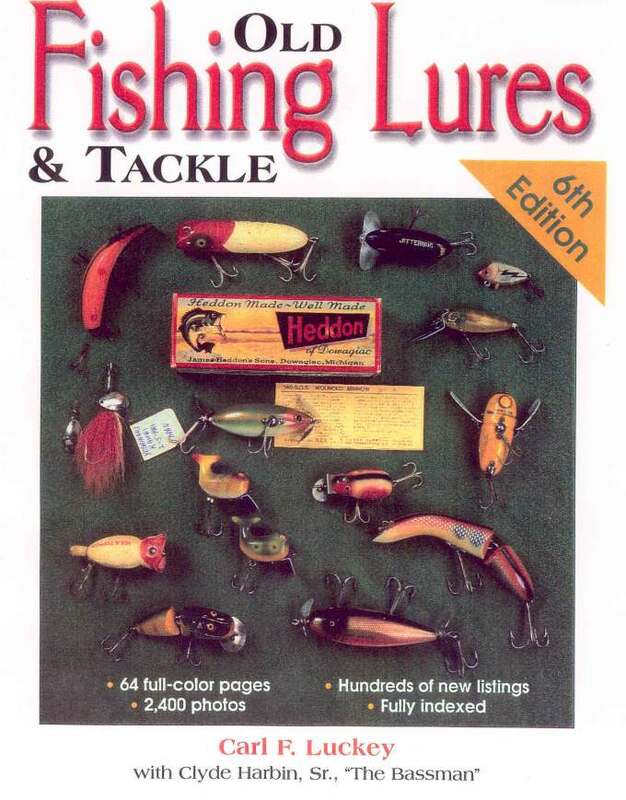 Krause Publications published the 5th Edition of Old Fishing Lures & Tackle by Carl F. Luckey. Mr. Clyde A. Harbin Sr. was heavily involved with Carl Luckey's first four editions of Old Fishing Lures & Tackle books that were published by Books of Americana. From Mr. Harbin's private collection he supplied Carl Luckey with all the lures, lure patents and lure catalogues needed for his books. Mr. Harbin and a selected group of knowledgeable lure collectors at the early swap meets priced all of the lures and reels for the first three Luckey Editions of 1980, 1986 and 1991 Carl Luckey's Old Fishing Lures and Tackle books. 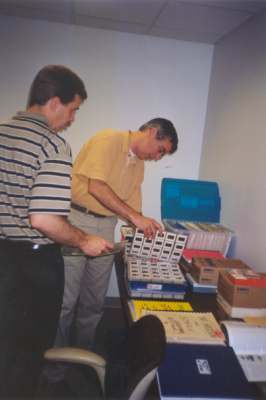 Mr. Harbin is sorting out 914 Heddon Catalogue 2 x 2 color slides shot in July and November 1981 from his and loaned Heddon Catalogs. On the screen in the top picture Clyde is seeing the cover of a 1925 Heddon Catalog. 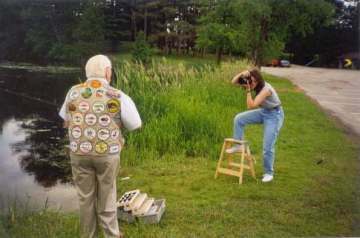 In preparation for his Iola, Wisconsin trip scheduled for June11, 2001 thru June16, 2001 he undertook to organize, sort and place in a 20 slide clear 3 ring binder slide page the 914 Heddon color slides for Krause Publications. Mr. Harbin will be meeting with Don Gulbrandsen (Senior Acquisitions Editor, Book Division), Paul Kennedy (Acquisitions Editor, Book Division) and Kris Kandler (Corporate Photographer) of Krause Publications, Inc. Mr. Harbin will be supplying the publishing company with new lure information for "The VI Edition of their Identification and Value Guide of Old Fishing Lures and Tackle". 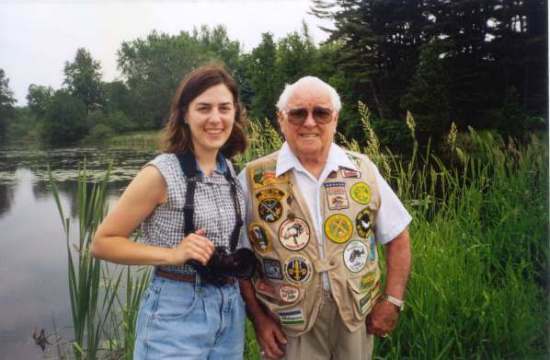 From his home in Memphis, Tennessee Mr. Harbin shipped what he called a "Mother Lode" of old lure information to Krause Publications in Iola, Wisconsin. 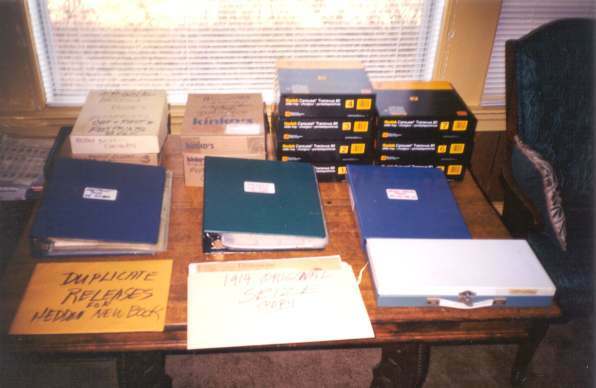 This "Mother Lode" consisted of 54 of Mr. Harbin's hand assembled lure information books, 2137 slides, 581 lure pictures, 435 lure patents and his new lure information. 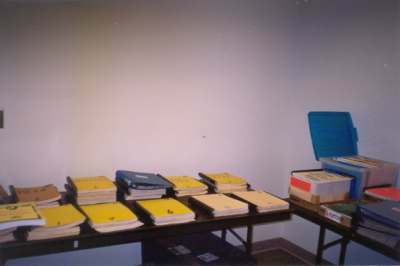 The above photographs were taken after the "Mother Lode" arrived at Krause Publication in Iola, Wisconsin awaiting for Mr. Harbin's arrival on June 11, 2001. 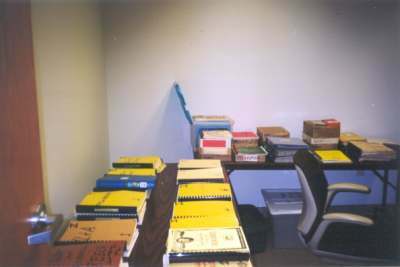 Among all of this lure material were 54 volumes of Mr. Harbin's hand assembled lure books which were used in the first and proceeding publications of Old Fishing Lures and Tackle by Carl F. Luckey. 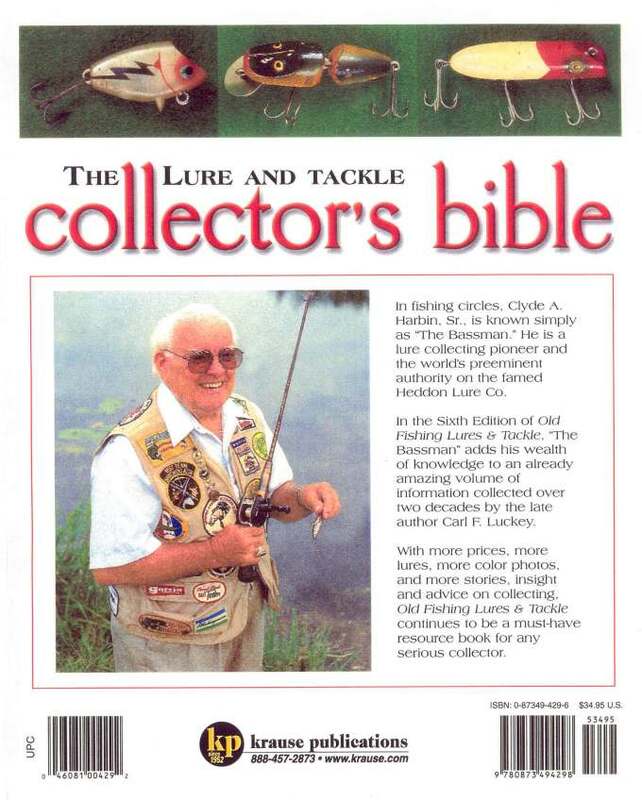 Mr. Harbin supplied Krause Publications with the same material along with addition new lure information for their VI Edition of this famous book. 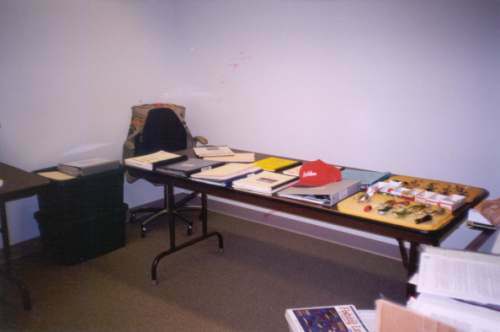 The blue tub of material in the upper right corner of the third photo contains 435 lure patents that Mr. Harbin received from a Washington law firm. 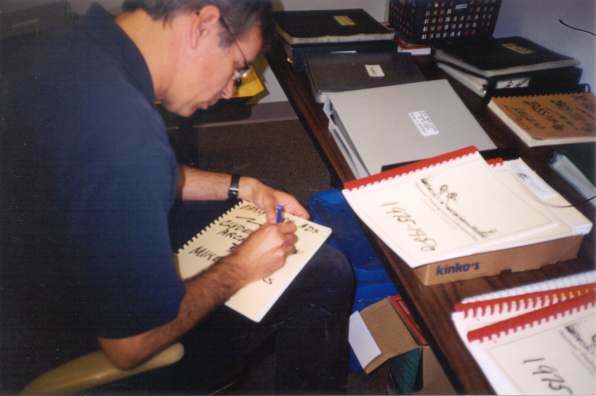 Mr. Harbin presented the same volumes of his hand assembled books along with a copy of the 1st, 2nd and 3rd Editions of Old Fishing Lures and Tackle by Carl Luckey to Krause Publications all as gifts. Iola Room "The Bassman® Table"
Above Mr. Harbin displays examples of a few Handcrafted lures, Dam/ Vampir lures and some Heddon/ PRADCO Centennial lures. As wood lures are being bought up by collectors and various collector clubs they are becoming very scarce to find. Other lures such as Heddon/PRADCO Centennial lures and Handcrafted lures have become popular among collectors and they are now finding their way into collectors display cases. Mr. Harbin realized the lack of printed lure information when he started seriously collecting back in 1964. He has been researching old lures and documenting his experiences for collectors ever since. 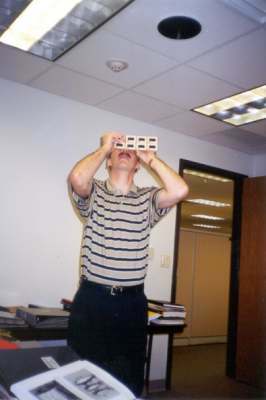 This was the reason he saw the need to help supply Krause Publications with his new lure information that would be used in the VI Edition of Old Fishing Lures and Tackle. While reviewing Mr. Harbin's new lure material and pictures. 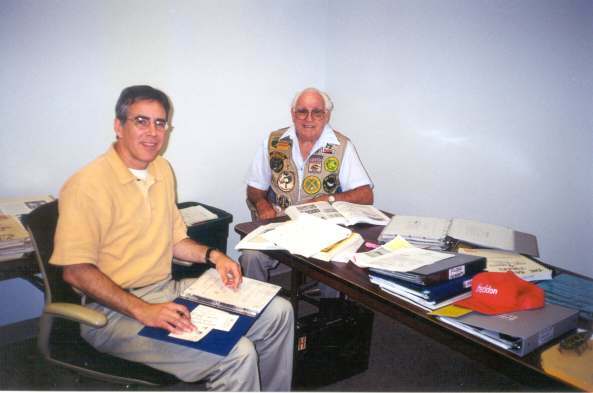 Paul Kennedy and Clyde Harbin discuss where the material could be used in the VI Edition of Old Fishing Lures and Tackle. 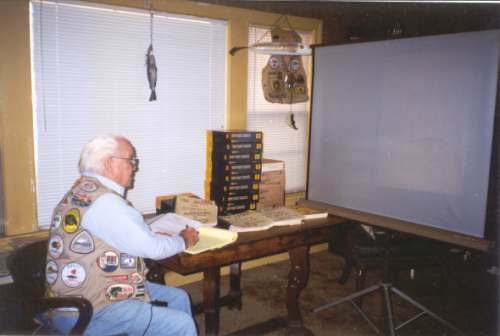 Some of the new lure information will include information on Heddon/PRADCO Centennial lures and DAM, Vampir lures that were manufactured in Germany which resemble the Heddon, Gamefisher..
Don Gulbrandsen and Paul Kennedy are going over the many slides that Mr. Harbin supplied Krause Publication for this new edition. 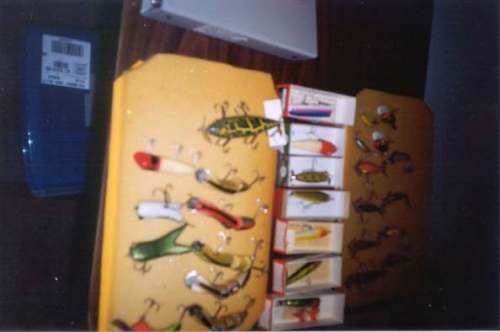 Mr. Harbin supplied the publishing company with 2137 slides of old lures for them to view. 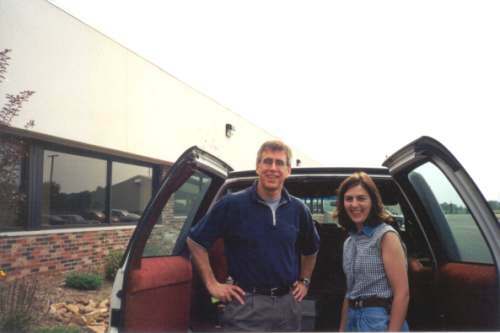 Paul Kennedy, Kris Kandler of Krause Publications, Inc. and Mr. Harbin are preparing to depart for a short road trip. 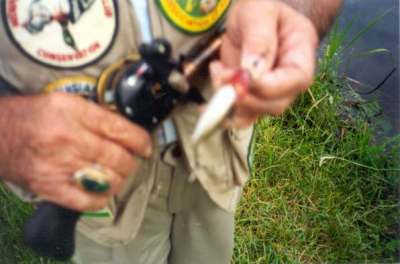 They are going to the Iola Pond where Mr. Harbin will demonstrate casting and retrieving the below Heddon lure. Mr. Harbin tied on a Heddon, River Runt Spook lure from the tackle box of Ken Ramage (Editor, Gun Digest, Krause Publications). The rod and reel was also borrowed from Ken Ramage for this special occasion. Mr. Harbin will demonstrated the action of this lure by casting it in the Iola Pond and showing his retrieving skills. 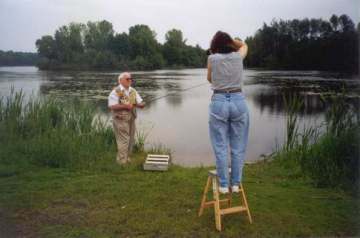 Ms. Kris Kandler (Corporate Photographer) is photographing the action at the Iola Pond while Mr. Harbin demonstrates casting and retrieving the red and white Heddon, River Runt Spook lure. 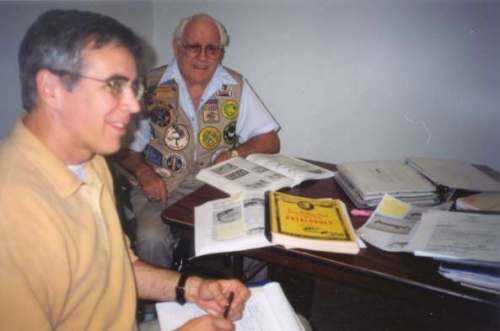 Kris Kandler and Clyde A. Harbin Sr.
Mr. Paul Kennedy, Acquisitions Editor for Krause Publication and Mr. Clyde A. Harbin Sr. meet and discuss the future publications of The James Heddon Son's Catalogue and Heddon Historical Footprints books. 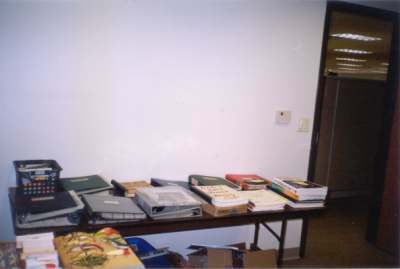 The #300 copy of The James Heddon Son's Catalogue is in the foreground and possibly Mr. Harbin's final available copy. Mr. Harbin made a great move to continue his footprints in Wisconsin. 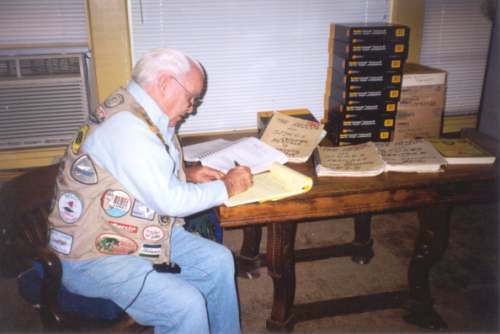 Krause Publication has purchased Mr. Harbin's copyrights for James Heddon Son's Catalogue and Heddon Historical Footprints books. These two excellent Heddon informational books will be published by Krause Publications, Inc. in the future. 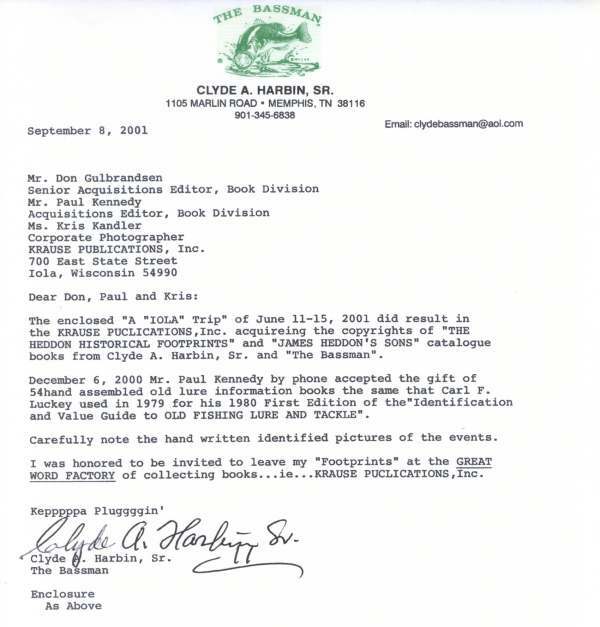 Paul Kennedy "The Great Keeper of the Word Factory of Collecting Books"
Carefully note the September 8, 2001 letter by Mr. Clyde A. Harbin Sr. where he documents that he sold the copyrights to The James Heddon's Sons Catalogues and The Heddon Historical Footprints books to Krause Publications Inc. Mr. Clyde A. Harbin Sr. proudly presents and leaves his Footprints with Krause Publication, Inc. in Iola, Wisconsin.